Few things are as subjective as company valuation, especially a company not floated on a stock exchange. Even well-worn measures such as '5 times profit' can be argued up (or down) by factors ranging from market conditions, sales growth, underlining debt, or corporate structure. 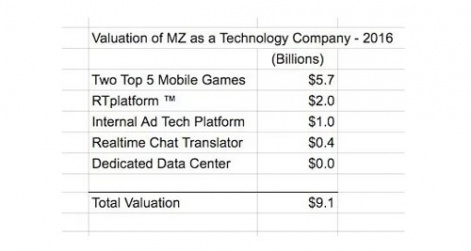 Nevertheless, the suggestion that MZ (the rebranded Machine Zone) is worth $9 billion is something of a surprise. Remember Activision-Blizzard bought King for $5.9 billion. Not that PocketGamer.biz has anything but the highest regard for the developer of top grossing games Game of War and Mobile Strike. After all, it was #1 on our Top 50 Developers of 2016 list. The $9 billion figure comes from irregular F2P mobile game financial blog GloMo, which is generally very bullish about Machine Zone. In terms of the valuation, author Lawrence W. Abrams is particularly impressed by the potential for company's recently announced RTplatform. Indeed, while using comparisons to King, Supercell etc, he values Machine Zone's $2.4 billion annual game business at $5.7 billion (high perhaps but not unreasonable). He reckons the nascent RTplatform adds $2 billion, with its related (and similarly embryonic) ad tech business brings in another $1 billion. The reason is Abrams thinks RTplatform will be highly valuable in any industry that needs to handle large amounts of real-time data. He suggests the $190 billion auto insurance pricing business, traffic management, even ticketing for baseball games are good examples. Of course, it's all highly speculative - as company valuations tend to be - but nevertheless an interesting read for anyone who want to learn more about the industry works.